Going into this summer, Los Angeles Lakers fans were skeptical, to say the least. There were just four players under contract, including a $33 million dollar backcourt that played less than 20 combined games last season. The team had over $20 million dollars worth of cap room, more than enough for LeBron James, Carmelo Anthony or Chris Bosh, but very few building blocks in which to attract those players to L.A.. Even after an excellent draft night including acquiring Julius Randle and Jordan Clarkson, the prospects of the Lakers transforming back into a contender were slim. Carmelo seemed to be changing his mind after a “very convincing” presentation from Lakers brass. There were rumors that LeBron James felt the same way. Kyle Lowry seemed interested in signing. Pau Gasol, for all the trade rumors swirling around him the previous three seasons, was locked in to re-sign in the event that the Lakers made positive strides with any other free agents. Despite what some felt would be a bleak summer, as always, the sunlight was peering through the clouds in Southern California. This is what I called “Plan A” in a piece I penned right here on Silver Screen & Roll weeks ago. The Lakers, despite Kobe’s massive contract and all the mistakes made with Dwight Howard and Steve Nash, would rise from the ashes and begin the latest championship era of Los Angeles basketball. With either James, Anthony or both in the fold and Bryant’s deal coming off the books in two seasons, the Show would be locked and loaded for years to come. Plan A, it seems, has been a massive failure. What now? Plan B is well underway. Bockerknocker: Nobody needs to explain the current state of the New York Knicks. Similarly, nobody needs to explain that the hiring of Phil Jackson to run the basketball operations of a once-proud franchise is a good move. What this really means, however, is that owner James Dolan must be Straight-Shot scared that his good buddy Carmelo Anthony will really leave for greener pastures this offseason. We’ve seen this tired act of “autonomy” given by Dolan before. Former wheelchair-bound general manager Donnie Walsh was given the directive of getting the Knicks out of the hole that Isiah Thomas continued to dig even after his ouster. But remember when Walsh was ready to pass on sending young players and quality draft picks to Denver for Anthony, knowing that the ready-to-leave superstar would sign in free agency? Dolan stepped in, mortgaged the future for a “me first” player, and autonomy was vanquished. Jackson comes to the Apple with a much richer caché, of course, and is far more likely to hold Dolan to his word. But before he arrived, I, for one, assumed Anthony would stay for the money and for the ability to choose his next coach. Now, Jackson won’t allow that, and all the championship rings in the world won’t be able to convince Anthony that he should waste one of the final years of his prime in the hopes that Jackson will reload for 2016. If Anthony does stay, it will be a testament to the team-first character of which Jackson believes is within Anthony, based on the role Anthony played on Team USA. It will also justify the hire without regard to whatever happens next. But one thing must be clear: the Bockers are still a 2016 team, at best. There is no amount of Zen that can change that. KOBEsh: In the midst of OT during Game 4, you texted me “We’ve had one good game all series. The Celtics are that terrible.” What in particular has been so awful about YOUR…New York Knickerbockers? And do you think this has any bearing on how far they can go in the playoffs? 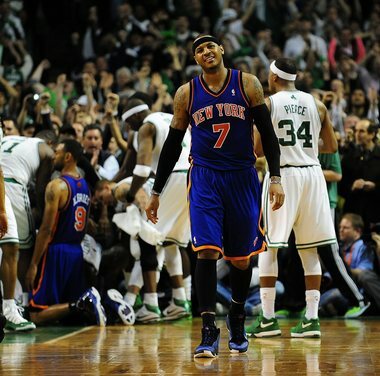 BockerKnocker: For four straight games, the Knicks have depended too much on Carmelo Anthony. There is blame to be shared all around. Anthony demands the ball on every play, his teammates give in, and head coach Mike Woodson doesn’t do anything to stop it. It becomes much easier to defend a scoring machine when help defenders are focused on one player. The Celtics are willing to let the other Knicks beat them, which is par for the course, but the problem with going through Melo on every play is that the guy gets fatigued relatively early. The PnRs with Raymond Felton and Tyson Chandler have been rare; those plays enabled Melo to basically rest by spotting up from 3, where he shot a career high this season. Why doesn’t Novak play with Carmelo? Most of the Discount Double Check minutes occur when Melo takes his early 2nd and 4th quarter rest. Novak’s help defender can never stray too far, while Felton and Kidd’s men will always take that risk. We’re back! With the first episode of 2013, THE GREAT PODBINO checks in with KOBEsh, El Miz and BockerKnocker on the New York Knicks. Check it out! Lin and Linsanity are gone, ending a stint with the team that, ten years from now, will literally feel like it was make believe. Now, moreso than any time since the Knicks traded 3 starters and 5 players overally to acquire him, this team is Carmelo Anthony’s and Carmelo’s only. This team is built around his strengths and, in order to thrive, Carmelo Anthony needs to thrive. After the Lin debacle — and really, it was a debacle, whether you were for or against the Knicks bringing him back, the matter in which it was carried out was laughably unprofessional and silly — the next biggest story of the offseason featured Amare Stoudemire down at Hakeem Olajuwon’s ranch, working on post moves. Stoudemire, having played his entire career in Mike D’Antoni’s offense as the “pick” man on the high pick and roll, never developed any semblance of a post game, although his jumper has become increasingly reliable. Even though the Knicks are bringing back Raymond Felton, who quarterbacked the Knicks offense to remarkable efficiency over 54 games in 2010-11 (Felton averaged 17 points and 9 assists in his first go-round as a Knickerbocker; Stoudemire averaged 26 points per game on 51% shooting with Felton running the offense), the Knicks believe that Stoudemire needs to play like a more traditional power forward for the team to be successful in 2012-13. LeBron James is a coward. The self-anointed Chosen One has led a NBA career with varying highs and lows, astounding us along the way with a dazzling combination of size, speed, grace and strength. Never before had we ever seen an athlete that drew comparisons to a Transformer; a burning locomotive train that could change into a blackbird jet at any given moment. LeBron’s promise to his consumers has been that indeed, he would be the one to bring basketball to heights never before seen – we are all witnesses, afterall. However, in a folly of hubris fit only for a King, James has yet to deliver on his various pledges; while he has amazed, he has yet to conquer. The progenitor of the South Beach Theory, a situation where in trying to add value to your own personal “brand”, you actually diminish it, LeBron has somehow become the most despised player in the league. We should be thankful that he spends his time bestowing his gifts and otherworldly play upon us, and yet, we’ve come to resent the cowardice from a man who has shown a reluctance to walk the self-instituted path we’ve lined the streets of, waiting for ascendance. LeBron James was drafted in 2003. 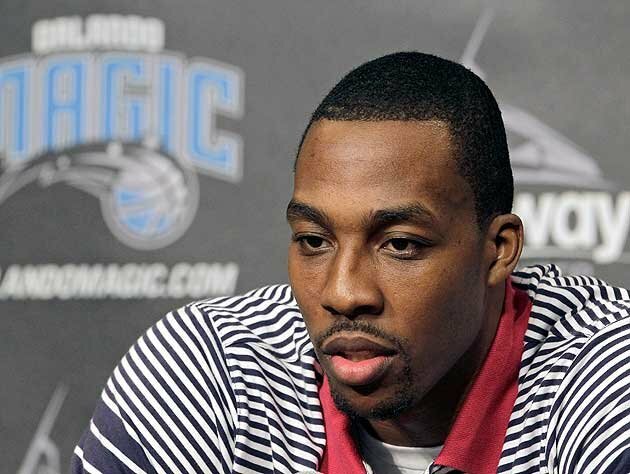 Dwight Howard is a indecisive lout. Thought to be the next in the lineage of the great NBA centers of all-time, Dwight has ostensibly strayed from his labeled ancestry that Kareem, Ewing, Hakeem, the Admiral and Shaquille occupied. Though each of those men were laden with early to mid-career blunders, Howard’s value in his eighth season seems lower than ever. At this point, Howard is best known for three things : 1) his all-world defense, 2) his noteworthy physical features, which range from his goliath-like shoulders to smile nearly broader than his countenance, and 3) an unbelievable hesitancy to be decisive. For nearly a year, the daily rumor mill has been rife with buzz of where Howard will continue his career. In a media storm that would embarrass a drunk Jose Conseco, Dwight managed to throw his coach, general manager, team and unwittingly, himself, under the bus. Though committed to the Orlando Magic for the 2012-2013 season, Howard continues to leave his team in managerial purgatory, not knowing whether he’ll sign an extension to stay or leave for nothing. Oddly enough, Howard’s unwillingness to make a decision regarding his contract future is mirrored by the lack of progress in his basketball repertoire. He is largely the same offensive and defensive player he was 4 years ago. Regardless of how you feel about LeBron as a person or a salesman, you have to admire that at least he’s attempted to improve his game. Orlando’s center has not. Dwight Howard was drafted in 2004.